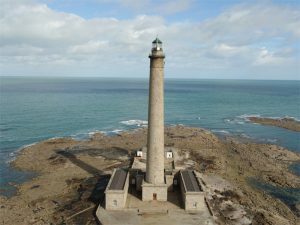 Located in the extreme north-east of the English Channel, the lighthouse of Gatteville offers a magnificent panorama to the various visitors who bravely climbed its steps. As a result of shipwrecks due to strong currents (the “raz de Gatteville” and the “raz blanchard” are two areas of strong current in the English Channel and have caused numerous strandings) and pitfalls, a first coal lamp and then operated with oil lamps built in 1774, under the reign of Louis XVI. One can quote the striking stranding of the Norman ship “blanche-nef” (“white nave”) during which many noblemen of the time died, including the heir to the throne of England, Guillaume Adelin, son of King Henry I Beauclerc. The latter became a semaphore when the current lighthouse was completed in 1835 to support modern lenses. It is always present behind the current lighthouse tower. Ask at the front desk to open the front door at the bottom of the lighthouse. The climb of the spiral staircase of 365 steps leads you to a superb panorama and the invigorating air of the coastline of the Val de Saire. You can go around once at the top of the lighthouse. Admire in particular the mill restored by a private individual located not far in the direction of the south. note1: Minors under 16 must be accompanied by an adult (over 18).